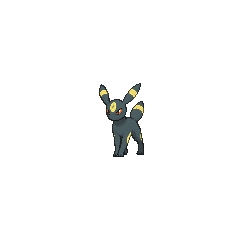 Umbreon in game: 763 Who? Important notice! 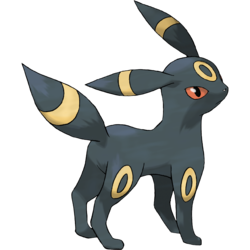 Pokemon Umbreon is a fictional character of humans. It is the starter Pokémon in Pokémon Colosseum alongside the other Generation II Eeveelution, Espeon. Gary's Eevee evolved into an Umbreon some time before Power Play!. Umbreon also appeared in Trouble's Brewing and Espeon, Not Included under the ownership of one of the Kimono Sisters. Dawn's mother, Johanna, owns an Umbreon, which first appeared in Strategy Begins at Home! where it was used in a two-on-two Contest Battle alongside Glameow against Dawn's Piplup and Pachirisu. 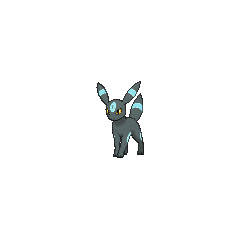 An Umbreon appeared in Team Eevee and the Pokémon Rescue Squad!, along with an Eevee and its evolved forms, under the ownership of Virgil. In a flashback, it was shown how it evolved from an Eevee during a night with him. An Umbreon appeared in Eevee & Friends with an Eevee and its evolved forms, including the newly introduced Sylveon. An Umbreon appeared in Gary's explanation in Johto Photo Finish. Umbreon made a small cameo in the beginning of Giratina and the Sky Warrior together with an Eevee and other six Eeveelutions. In The Battle Club and Tepig's Choice!, Umbreon was mentioned in Ash's Pokédex after mistaking a blackened-up Tepig that broke out of the warehouse for it on a monitor. An Umbreon appeared in a fantasy in Tag Team Battle Inspiration! where Serena imagined what her Eevee could evolve into. Two Trainers each owned an Umbreon, which appeared in The First Day of the Rest of Your Life!. In Volume 14, Karen is seen with an Umbreon as the cornerstone of her team, as in the games. It apparently evolved from the Eevee she had since her childhood. Greta of the Battle Arena is seen using an Umbreon in her battles with Guile Hideout and Emerald, during which it easily defeats his Dusclops before falling to his Sudowoodo, which goes on to win the match, earning him the Guts Symbol. He likes to compose a racecourse and let someone run it. He composes it quickly and accurately. 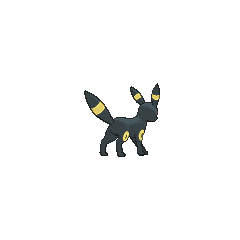 Umbreon was the only pure Dark-type Pokémon in its debut generation. 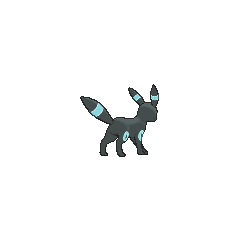 Umbreon's origins are uncertain, though it could be based on a black cat or possibly a black fox, a color variation of the red fox. Its long ears also are similar to those of a hare; numerous East Asian legends concern a Moon rabbit. The rings on Umbreon's body look like Egyptian lunar markings and jewelry that have been associated with animal sculptures, such as cat statues of Bastet and statues of the jackal fake, Anubis, from Ancient Egypt. They may also be meant to resemble solar eclipses. 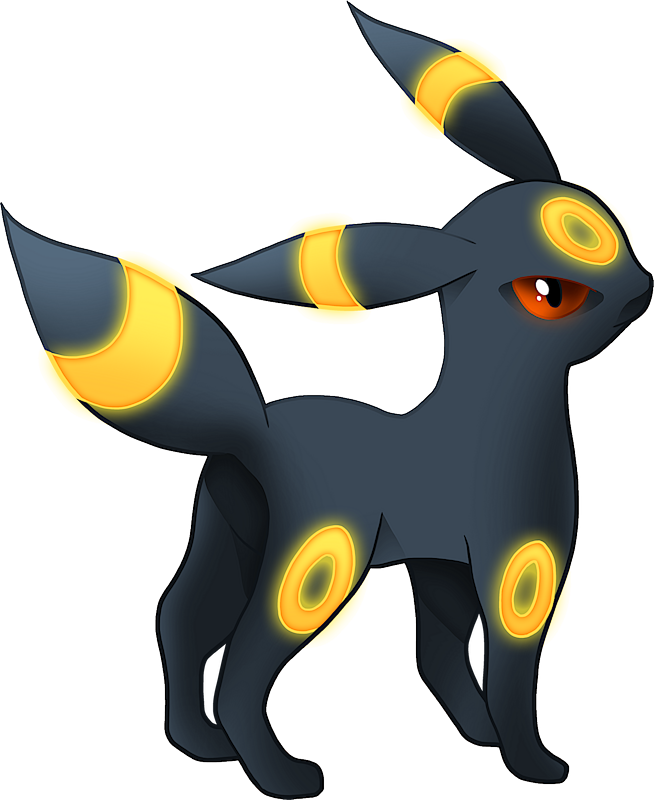 Umbreon is a combination of umbra (Latin for shadow and ghost, as well as the name for the moon's silhouette during a solar eclipse) and eon, a shortened form of evolution, the word also meaning an immeasurably long period of time (possibly referring to how long evolution takes naturally). Eon is a suffix all Eevee evolutions share and was Eevee's English prototype name.